Alright, take a deep breath. You’ve just planned your annual vacay to the Great Smoky Mountains. 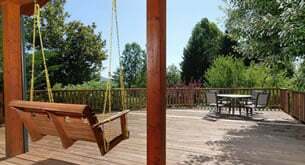 Your Gatlinburg cabin rental is booked. And you’re sort of panicking about what you’re going to do in Gatlinburg, TN, for 5 days… Maybe you’re feeling overwhelmed by all the attractions, best panoramic shot spots, recommended restaurants, and shopping centers. We totally get it! Our piece of advice: don’t stress if you can’t experience everything in 1 trip. Narrow down your options by choosing new adventures, familiar favorites, and a few trusted recommendations. Need a little inspiration? Check out our planned 5-day trip to Gatlinburg. Feel free to deviate from our guiding path — this is YOUR vacation after all! After traveling most of the morning or day, it’s time to relax. Treat yo’self to an afternoon nap on your cabin’s plush sofa or unwind with a glass of sweet tea on the porch swing with stunning mountain views. When you feel a little recouped, head into town for an Instagram-worthy dinner at The Peddler Steakhouse, featuring crab-and-shrimp-stuffed mushrooms, filet mignon with steak fries, and Kahlua crème brûlée. Chase your meal with a sampling of classic mountain shine at the Ole Smoky Moonshine Holler (the most visited distillery in the country). Afterwards, the designated driver can take everyone back to the cabin for a little down time with huge bowls of buttery popcorn and a feature film in the private home theater with big screen TV and surround sound. When the hero finally defeats the villain, say goodnight to the gang as you head to the master suite for a soothing spa bath in the jetted tub with bubbles, scented candles, and tranquil tunes. Now, it’s time to slip into the cool sheets of the king-size bed, steal a few cuddles from your spouse, and drift to dreamland. Wake up to songbird symphonies, morning hues across the mountaintops, and a hot breakfast from the fully equipped kitchen. Next? Oh yes, it’s playtime — get ready and head straight for downtown fun! Start your day of play at Anakeesta, an aerial adventure park with ziplining, a mountain coaster, boutiques, restaurants, a treehouse playground, walking trails, and much more (honestly, we could spend all day here)! After lunch, slow things down a bit and take a leisurely stroll through Ripley’s Aquarium of the Smokies, where you can find Nemo, hang out with penguins, and stroke jellies. End the day with mini golf, ice skating (year-round at Ober), a theatre show, and more in-town fun at choice attractions! Oh, you know what time it is — window shopping is over! You’ve been passing shops along the way to restaurants and fun attractions, and now it’s time to take a peek inside. After spending some time in the area, you no doubt have a few shops on your mental must-browse list, so hop to it! Smoky Mountain souvenirs, home décor, new fashion, sweet treats, furniture pieces, local brews…and that’s just the start. Where to begin? Give the European-inspired Village Shops a try! After perusing downtown, we highly recommend visiting the Great Smoky Arts & Crafts Community (only 3 miles away). As the largest independent group of artisans in the nation, this 8-mile loop road is home to 100+ artists and craftsmen. Here, you’ll find a plethora of locally handmade crafts: baskets, quilts, brooms, paintings, glass-blown ornaments, candles, jewelry, carvings, metalwork, pottery, statues, leather goods, soaps, dulcimers…you name it! Branch a little further out of town to the Great Smoky Mountains National Park — the most visited national park in the country. And it’s totally FREE to enter! There are 800+ miles of hiking trails that lead to stunning waterfalls and hidden coves. Not to mention, there are tons of cutesy critters that may cross your path (keep a safe distance, of course), such as otters, foxes, racoons, turkey, white-tailed deer, salamanders, and black bears. Be sure to bring plenty of water and a few snacks to stay energized for your full day of adventure! Whoa! Before heading home tomorrow, be sure to recharge for your journey. Our recommendation: chill at your Gatlinburg cabin rental. Start the morning with a fresh fruit smoothie, followed by a rest in the rocking chairs as the sun peeks over the…well, peaks. Move on to your in-cabin massage, which you’ll really appreciate after playing, shopping, and exploring this week. Ready for a splash? Head downstairs to the private indoor pool, where you can teach your littlest to swim, monitor Marco Polo, or lounge on a floatie. After tackling restaurant leftovers for lunch in the dining room, challenge everyone to a rousing game tournament in the rec room, from foosball and pool to arcade and card classics. Winner chooses the main pizza toppings for dinner delivery as the rest of the crew readies to jump (not literally, please) into the hot tub on deck as the sun now sets behind the trees. Ah, your last night in Gatlinburg is here! Make it a memorable one with friendly chats and toasted marshmallows round the firepit before heading to bead for sweet dreams in the Smokies. No matter what you decide to do, we guarantee you won’t leave disappointed when you relax, play, shop, explore, and recharge in Gatlinburg, TN!